Reminder: the media is a means to broadening citizens’ minds, arousing their curiosity, entertaining, making them laugh or cry. One learns a great deal, one reacts. A democracy is built on the beliefs of citizens and their determination to fulfil their dreams. Protecting earned freedom requires constant vigilance. The media is the thread that braids the democracy and unites the citizens in protecting liberty. Left in the hands of a tyranny and its interests, the media is a shame, slashing the society and abandoning the citizens to vile rumours. Who art thou? Whom do you inform? Since Shiism was officially recognized as the State religion in the 16th century, the ayatollahs have taught domestic despotism, which kills the individual’s freewill and secures his blind obedience; they also refined the despotism of the State, which enslaves people and builds an irresponsible nation. From the advent of printing, followed by radio and television and now the Internet, the media in Iran is the business of the despotic regime in command; he pays it and sets its mission: consolidating the leader’s figure, brushing off its critics and blocking all social and political evolution. In 2015, the Iranian media is a formidable misinformation engine. All those who earn their bread by it, from the reporter to the web master, from the cameraman to the screenwriter, including the photographer and graphic designer … all call themselves journalists, like you do. All, tens of thousands of them, are orderlies under the supervision of the ministries of censorship and propaganda. Like you. As despicable as his work, the role played by the censor-propagandist of the ministry is crystal-clear. But you, Iranian journalist, what do you do? Prior to 1979, your colleagues produced lies and half-truths to praise the politics of a megalomaniac Shah. In 1979, between the time you titled “The Shah’s gone – Shah Raft” and the day you published “The Emam’s arrived – Emam Amad”, you just had time to grow a beard, remove your tie and tailor your coat to suit events. Just in time to cheer a power-hungry and equally megalomaniac Vali-e Faqih. Are you aware that you are the herald of the sordid blabber of the ayatollahs? And their protector and accomplice? In any country, the information is like blood circulating in a body. When lies and propaganda take the place of information, blood poisoning ensues. Healthy cells are destroyed, the body and mind are paralysed. This is what has happened in Iran. Generation after generation, you have been the vector of toxins and misinformation . Out are facts that would be beneficial to democracy and cohesion of citizens. What do you tell your public? 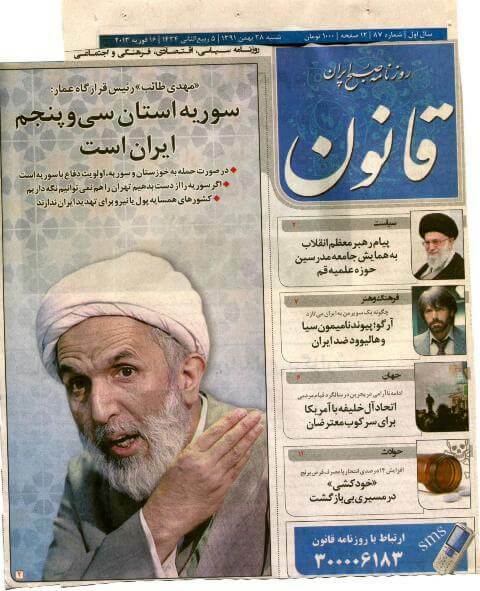 You have interest only in the leaders: Khomeini is still your favourite, 25 years after his death. 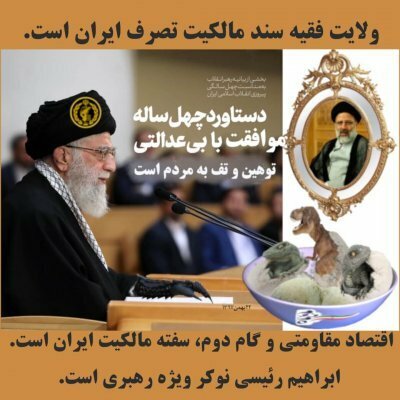 Khamenei hits the headlines every day that your Allah makes. For you, whatever happens in Tehran and all the nonsense uttered by the ayatollahs and their ministers are enough to make news items. You drum into us the greatness of Iranian nuclear advances in terms worthy of a blooper; your nonsense on Islam and its enemies is sickening, your dreadful economic comments do not even convince a moron. When the news is flat, or needs camouflaging, you publish fabricated stories … or worse, you publish on the front page photos of homosexuals hanged to cranes and bridge pylons, and those appalling “public confessions” in a loop … The infamy. Lethal pollution choking cities? Gloomy provinces and their inhabitants? Agricultural products saturated with pesticides? You brush them off … Since a long, long time, you renounced informing us on the Baha’i, the Jews … the Kurds, the Arabs … except when they are suited to belittling. Galloping inflation humiliates the elderly that die off in poverty, young people lose hope and give up. But you do not give a hoot … The shame. Investigation? Story-reporting? Documentary? Decryption of information in context? All open and honest? Do not bother yourself. From children’s publications to the most serious events for the country, you accommodated them to the taste of the ayatollahs, as your peers before you did for the Shah. In your heart of hearts, you know better than anyone else: in Iran, one becomes a journalist by chance, in wait for better days in a country plagued by unemployment. You learn the ropes for the job, walking in the footsteps of those who have extensive experience of sycophancy, and none of freedom. The narrowness of your knowledge and / or the vastness of your ignorance does not matter, you just have to embroider the speech of a Prince of the State and omit what he commands you to forget. What does remain of a vocation for freedom of speech? Of fight for the dissemination of honest, quality information? Of a desire to bring together citizens? Nothing. In the early 20th century, if a couple of thugs were enough to punish your rebellious fellow by breaking his printing material, today is a devoted State machinery. So effective! This machinery goes into motion to eliminate the critics, even the most moderate. You do have in mind the financial and physical threats to you and your loved ones. In general this is enough for you to stay in line. Revealing the facts leads you to Evin and Kahrizak to be maimed or murdered; or else you take the road to exile. Of these incongruous destinies, other Iranian citizens, average and unlabelled, have their share. All this is the same old tune; it’s been sung since the late 19th century. If you have the courage, the vocation and the integrity of your job, shut up and go thee. Velayat-e faqih is lost and cannot be changed or recovered by critique. Your life is too precious, save it. Let the printer remain idle, let the TV and the radio (IRIB) remain silent, let the halal internet disappear from cyberspace … Without heralds, the Islamic Republic is nothing but a windbag. What does become of you in your land of exile? Where are credible medias “in exile” entirely made by Iranians for Iranians? Some five million Iranians live abroad. They would like to have information about their country in their own language. They content themselves with international press and gossip from their relatives: ersatz news for a country that is four times the size of France. Our country is dying in her empty shell. We can remain idle and watch her agony … or fight to keep her alive. You, Iranian journalist, if you decide to join those who fight, learn your job first: take it upon yourself to carry the absolute right of ALL Iranian citizens to speak out and be heard by ALL Iranian citizens. Eventually, you’ll come to respect your public and be respected in return. Chronicles from Iran [ebook Edition]: What is Sauce for the Goose, is Sauce for the Gander.